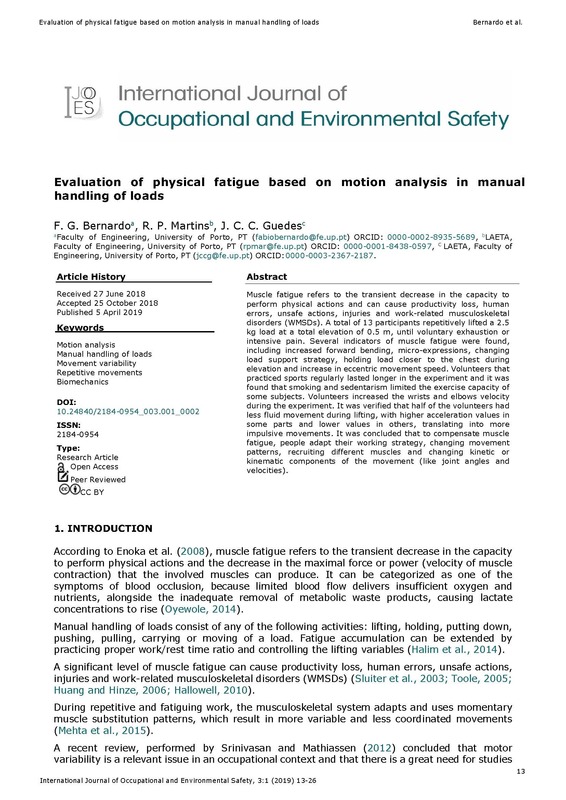 Muscle fatigue refers to the transient decrease in the capacity to perform physical actions and can cause productivity loss, human errors, unsafe actions, injuries and work related musculoskeletal disorders (WMSDs). A total of 13 participants repetitively lifted a 2.5 kg load at a total elevation of 0.5 m, until voluntary exhaustion or intensive pain. Several indicators of muscle fatigue were found, including increased forward bending, micro expressions, changing load support strategy, holding load closer to the chest during elevation and increase in eccentric movement speed. Volunteers that practiced sports regularly lasted longer in the experiment and it was found that smoking and sedentarism limited the exercise capacity of some subjects. Volunteers increased the wrists and elbows velocity during the experiment. It was verified that half of the volunteers had less fluid movement during lifting, with higher acceleration values in some parts and lower values in others, translating into more impulsive movements. It was concluded that to compensate muscle fatigue, people adapt their working strategy, changing movement patterns, recruiting different muscles and changing kinetic or kinematic components of the movement (like joint angles and velocities).